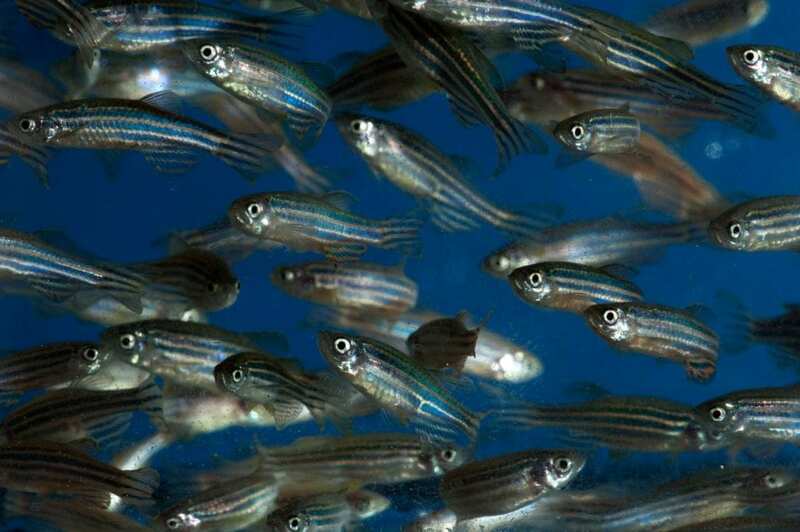 Zebrafish are an emerging power tool in cancer research. They can be engineered to light up when certain genes turn on — capturing the moment when a cancer is initiated. Because they breed so quickly, they lend themselves to rapid, large-scale chemical screening studies, so can help identify tumor promoters and suppressors. Now, as a new study in Science demonstrates, zebrafish can also help scientists dissect the intricate molecular pathways that underlie many cancers, and could help guide treatment strategies. Collaborators at Boston Children's Hospital and the University of California San Francisco (UCSF) focused on mucosal melanomas — rare tumors found not on the skin, but in the linings of the respiratory tract, mouth, GI tract and genitourinary tract. Mucosal melanomas tend to come to light only when very advanced. Their biology is poorly understood, and they tend to lack the genetic mutations associated with skin melanomas. Thus, few patients benefit from targeted therapies. The five-year survival rate is only 33 percent. That's where Leonard Zon, MD, and his colleagues at Boston Children's thought they could help. Zon's lab had already developed a zebrafish melanoma model that faithfully simulates human melanoma tumors and is easy to manipulate genetically. Could it shed new light on mucosal melanomas? "Zebrafish offer the ability to test genetic hypotheses quite rapidly," says Julien Ablain, PhD, a fellow in the lab. "Genetic sequencing gives you a lot of information, but not a functional understanding of what the genetic alterations do. Our melanoma model allows us to ask these questions in large numbers of fish — and make statistically significant observations." The Boston Children's team approached the lab of Iwei Yeh, MD, PhD at UCSF, which is known for having sequenced many different melanoma tumors. The lab indeed had a cohort of 43 patients with mucosal melanomas, as well as sequencing data. Analyzing these data for point mutations and DNA deletions and duplications, the researchers saw some intriguing clues. The top alteration involved a gene called SPRED1, never before implicated in cancer. It was inactivated in 37 percent of mucosal melanomas, but only 5 percent of skin melanomas. The mucosal tumors were also more likely than skin melanomas to harbor alterations in a gene called KIT, a known oncogene. Zon's team then took the genetic observations into their zebrafish. They injected the fish en masse as embryos, so the genetic changes found in human mucosal melanoma were recapitulated in every zebrafish melanin-producing cell. This allowed them to model the effects of all the combinations of genetic alterations that occurred together with SPRED1 loss in the 43 UCSF patients. Knowing that cancers often arise from a one-two genetic hit — activation of a tumor-promoting gene plus loss of a tumor suppressor gene — the Zon lab created a system to mix and match mutations. They used one vector to introduce oncogenes known to be relevant to human mucosal melanomas (namely, KIT, BRAF and NRAS) into the zebrafish. Another vector used CRISPR technology to delete known tumor suppressors (namely, tp53, pten and cdkn2a). In all, they tested 15 to 20 combinations of oncogenes and tumor suppressors. Within 1 to 4 months, all the combinations had been tested to see if melanomas develop in the fish. The tumors that arose resembled human mucosal melanomas, arising in non-skin locations including internal organs. Zebrafish that also had SPRED1 deletions had more severe melanomas, indicating that SPRED1 is a previously unrecognized tumor suppressor. Loss of SPRED1 was especially damaging in fish with KIT mutations: their melanomas were even more severe. The team then switched from zebrafish to human mucosal melanoma cell lines to delve into the cancer's biology and to understand SPRED1's role and its interplay with KIT. When Ablain and colleagues inactivated SPRED1, the melanoma cells proliferated faster. The reverse was also true. "If you overexpress SPRED1 in a KIT-driven zebrafish melanoma model, you delay melanomas," says Ablain. "That confirms that SPRED1 acts as a tumor suppressor." Loss of SPRED1 increased the activity of a cellular pathway called MAPK, known to be associated with skin melanomas — especially in tumors driven by KIT, which is part of the same pathway. "Before, it was unclear whether the mucosal subtype of melanomas was driven by MAPK activity," says Ablain. "Our data suggest that they are, even though the genetic alterations are different." The experiments also showed that when SPRED1 is lost, tumors become resistant to compounds that inhibit KIT. This suggests that patients with SPRED1 deletions would not benefit from existing KIT inhibitors — but could potentially benefit from other drugs that inhibit the MAPK pathway downstream of KIT, such as MEK inhibitors. To test that prediction, the researchers plan to collaborate with DFCI to look at past clinical trials involving patients with mucosal melanoma to see if they had SPRED1 deletions and whether they benefited from KIT inhibitors. Zon's lab also plans to look for SPRED1 in other kinds of tumors. Currently, SPRED1 isn't part of the panel of cancer-related genes often used to test patients, notes Ablain. "For targeted therapies, you really need to understand the molecular mechanism," he says. "That is the first thing this paper is going to change." "This paper establishes the zebrafish as an extremely quick model to study the many genes mutated and regulated in human cancer," says Zon, who is Director of the Stem Cell Research Program at Boston Children's Hospital and a senior physician with the Dana-Farber/Boston Children's Cancer and Blood Disorders Center. "In the future, patients could have their specific mutations modeled in zebrafish to guide decisions about their treatment." Ablain and Mengshu Xu of UCSF were co-first authors on the paper. Zon and Iwei Yeh of UCSF were co-senior authors. The study was funded by the Melanoma Research Foundation, the Dermatology Foundation, the Melanoma Research Alliance, the Ellison Foundation, the Starr Foundation, the V Foundation, the Terry Patters Melanoma Foundation, and the National Cancer Institute (1R35CA220481, R01CA103846, K99CA201465, T32HL007627) and the Howard Hughes Medical Institute. Boston Children's Hospital, the primary pediatric teaching affiliate of Harvard Medical School, is home to the world's largest research enterprise based at a pediatric medical center. Its discoveries have benefited both children and adults since 1869. Today, more than 3,000 scientists, including nine members of the National Academy of Sciences, 17 members of the National Academy of Medicine and 11 Howard Hughes Medical Investigators comprise Boston Children's research community. Founded as a 20-bed hospital for children, Boston Children's is now a 415-bed comprehensive center for pediatric and adolescent health care. For more, visit our Vector and Thriving blogs and follow us on social media @BostonChildrens, @BCH_Innovation, Facebook and YouTube.